Accidents happen every day. But some accidents reverberate much longer than others. An accidental pregnancy qualifies as a major life-changing event. However, Turning Point’s unique, one-on-one counseling, pregnancy-related medical care and proven programs and services can help any woman turn a so-called accident into one of the most character-building episodes of her entire life. When faced with an accidental pregnancy, the natural “reflex response” is part emotional, part physical and also part spiritual. And in many cases, they’re all entirely negative. When a woman faces an accidental pregnancy without a proper support system or someone to talk to, it’s understandable that she becomes moody, withdrawn and detached. But that shouldn’t be the accepted response to an accidental pregnancy. Case in point: more than half of all pregnancies in the United States can be classified as unplanned or accidental. Turning Point helps any woman in San Diego County with crisis pregnancies, including accidental pregnancies. Through our focused outreach, compassionate counseling and honest, open (including an open heart) communication, we’re helping woman throughout Southern California redefine accidental pregnancy as a “surprise pregnancy” – not the end of the world, but rather an opportunity for both mother and child to prosper and thrive without fear, guilt or uncertainty. 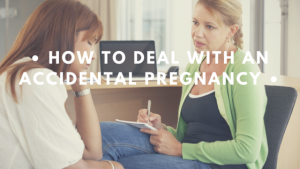 If you’re dealing with an unplanned pregnancy, getting help can be challenging. Fear, confusion and frustration cause many women to retreat into a protective bubble. And to seek “professional pregnancy help” may sound too clinical, too “official,” and too demanding. However, the Turning Point Pregnancy Resource Center has helped San Diego County-area women for a generation with down-to-earth, effective counseling, community-based resources, parental mentorship programs and much more. Think you don’t have any resources for an unplanned or unwanted pregnancy? Thank again! Turning Point can help. But first, you can help yourself by calling us today at (858) 397-1970. Proven, Proactive & Professional Pregnancy Help – Just a Phone Call Away! There isn’t a definitive resource or user’s manual for dealing with an unplanned pregnancy. That’s the bad news. However, the good news is that Turning Point can provide crucial guidance, support and a friend who understands your circumstances – someone who will listen to your unique situation. After all, if everybody’s unwanted pregnancy was the same, the resources and assistance would already be in place. But your unplanned pregnancy is one-of-a-kind. Turning Point’s personalized counseling, medical care and other initiatives give you the confidence and attentive support you need. Turning Point offers unwanted pregnancy resources for any woman in San Diego County. While family support is crucial, Turning Point’s professional pregnancy help offers medical assistance, counseling and community-based referrals – all free of charge! Dealing with an unplanned pregnancy is tough enough; don’t make it harder on yourself without having professional pregnancy help and proven, effective counseling. The Turning Point Pregnancy Resource Center provides a thorough “Patient Experience” process, where we conduct a pregnancy test, ultrasound (if eligible), registered nurse health assessment, client advocate meeting and much more. All of our services comprise the most complete and comprehensive unwanted pregnancy resources in San Diego County, and they are absolutely free. Don’t delay in getting professional pregnancy help and assistance. An accidental pregnancy is different for each woman, and your situation has a positive outcome – and Turning Point can provide the roadmap to get your there. Please call our office today at (858) 397-1970.